Former Pearl Jam drummer Dave Abbruzzesse is challenging the decision of Rock And Roll Hall Of Fame organizers to leave him off the list of band members set to be inducted into the Cleveland-based institution next April. Pearl Jam were among the artists named this week to be inducted into the Class of 2017, alongside Journey, the Electric Light Orchestra, Yes, Joan Baez and Tupac Shakur. Joining the current Pearl Jam lineup of Eddie Vedder, Mike McCready, Stone Gossard, Jeff Ament and Matt Cameron will be founding member Dave Krusen, while leaving out drummers Abbruzzese, Matt Chamberlain and Jack Irons. “The qualifications required for me to have been inducted with my former band mates certainly have been met,” writes Abbruzzesse on Facebook. 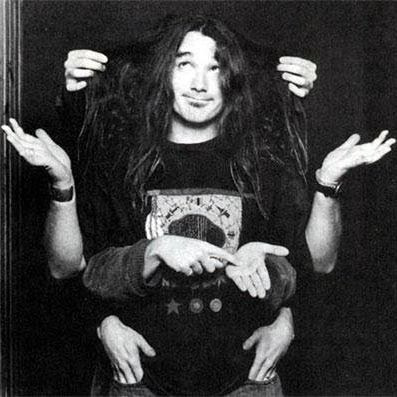 “I challenge anyone to justify why I am not worthy of a place in the history of Pearl Jam. The official reason given from the RRHOF makes it bulls**t.
The latest effort marks Abbruzzesse’s second attempt to be included as part of Pearl Jam’s lineup for the 2017 induction; he reached out to the band via social media to request their help in October when the Rock Hall announced the nominees.